This volume contains the papers and discussions from a Symposium on :'Hu- man Behavior and Traffic Safety" held at the General Motors Research Labora- tories on September 23-25, 1984. This Symposium was the twenty-ninth in an annual series sponsored by the Research Laboratories. Initiated in 1957, these symposia have as their objective the promotion of the interchange of knowledge among specialists from many allied disciplines in rapidly developing or chang- ing areas of science or technology. Attendees characteristically represent the aca- demic, government, and industrial institutions that are noted for their ongoing activities in the particular area of interest. 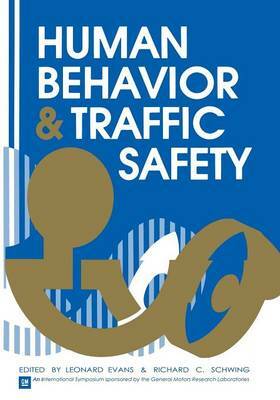 of this Symposium was to focus on the role of human behavior The objective in traffic safety. In this regard, a clear distinction is drawn between, on the one hand, "human behavior," and on the other "human performance." Human per- formance at the driving task, or what the driver can do, has been the subject of much research reported in the technical literature. Although clearly of some rel- evance, questions of performance do not appear to be central to most traffic crashes. Of much more central importance is human behavior, or what the driver in fact does. This is much more difficult to determine, and is the subject of the Symposium.